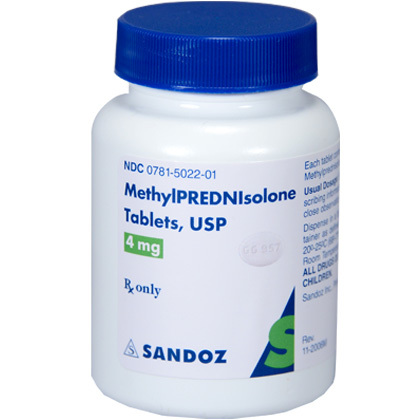 Long-term use of methylprednisolone, as with all corticosteroids, can be associated with hyperglycemia, decreased resistance to infection, swelling of face, weight gain, glaucoma, osteoporosis and psychosis, especially when used at high dosage. The most serious side effect occurs after the adrenal glands cease natural production of cortisol, which methylprednisolone will replace. Abrupt cessation of the drug after this occurs can result in a condition known as Addisonian crisis, which can be fatal. To prevent this, the drug is usually prescribed with a tapering dosage, including a pre-dosed "dose pack" detailing a specific number of pills to take at designated times over a several-day period. Pharmacists sometimes advise that this drug can cause sleeplessness and "down" moods. ^ Strupp M, Zingler VC, Arbusow V, Niklas D, Maag KP, Dieterich M, Bense S, Theil D, Jahn K, Brandt T (July 2004). "Methylprednisolone, valacyclovir, or the combination for vestibular neuritis" (PDF). N. Engl. J. Med. 351 (4): 354–61. doi:10.1056/NEJMoa033280. PMID 15269315. ^ "SOLU-MEDROL (methylprednisolone sodium succinate) injection, powder, for solution". National Institutes of Health. Retrieved 24 August 2012. The liver protective effect of methylprednisolone on a new experimental acute-on-chronic liver failure model in rats. Hu C1, Shen S2, Zhang A1, Ren B1, Lin F1. Digestive and liver disease : official journal of the Italian Society of Gastroenterology and the Italian Association for the Study of the Liver.Dig Liver Dis.2014 Oct;46(10):928-35. doi: 10.1016/j.dld.2014.06.008. Epub 2014 Jul 10. Experimental and therapeutic medicine.Exp Ther Med.2014 Oct;8(4):1170-1172. Epub 2014 Jul 17. Experimental and therapeutic medicine.Exp Ther Med.2014 Oct;8(4):1167-1169. Epub 2014 Jul 16. Explains the medication thmethylprednisolone (Medrol) a drug used to achieve prompt suppression of inflammation. Article includes descriptions, uses, drug interactions, and side effects.